Hoax, Conspiracy Theories and the Truth! The recent fiasco surrounding Manti Te’o’s non-existent girlfriend (photo at left shows her in the shower) and things like the 11 million views on YouTube showing how the federal government and the Screen Actors Guild conspired to create the ‘Sandy Hook Hoax’, have me convinced that our culture will not let the facts stand in the way of a good conspiracy theory. Not that people haven’t been lied to by their government, or the Screen Actors Guild for that matter, but as a public service I’d like to put forth the real truth about some of our most popular conspiracies. 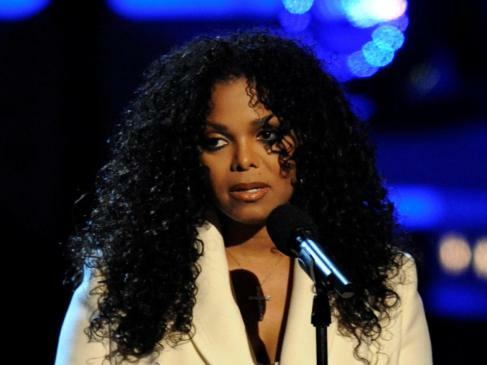 If you think that there is a possibility that Michael and Janet Jackson were actually the same person or that the ‘grassy knoll’ was never really examined as thoroughly as it could have been, then you need to read on. Anti-Conspiracy: Global warming is a hoax perpetrated by Carrier, the air conditioning people and a few awning and umbrella companies. The Truth: My anecdotal findings are that the globe seems to be warmer in the summer, so I lean toward the global warming theory, but it seems to cool down in the winter, so I can’t be sure. 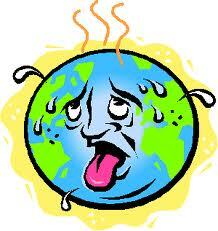 I’m going to read Al Gore’s book, An Inconvenient Truth – it’s on the Internet, which he invented. 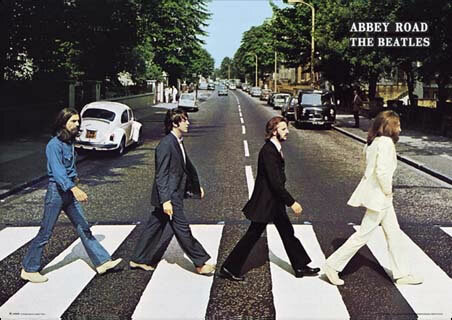 Conspiracy: Paul McCartney walking barefoot on the Abby Road album cover proves that he was actually dead. Supported by: Those who had high-tech record players back in the day that could play Beatles records backwards and hear Paul actually say that he was dead at the time. Anti-Conspiracy: Paul was late for the album photo shoot and forgot to put on his shoes. What amazingly has gone unnoticed over the years is that Ringo is not wearing any underwear in the photo – he is not dead either. 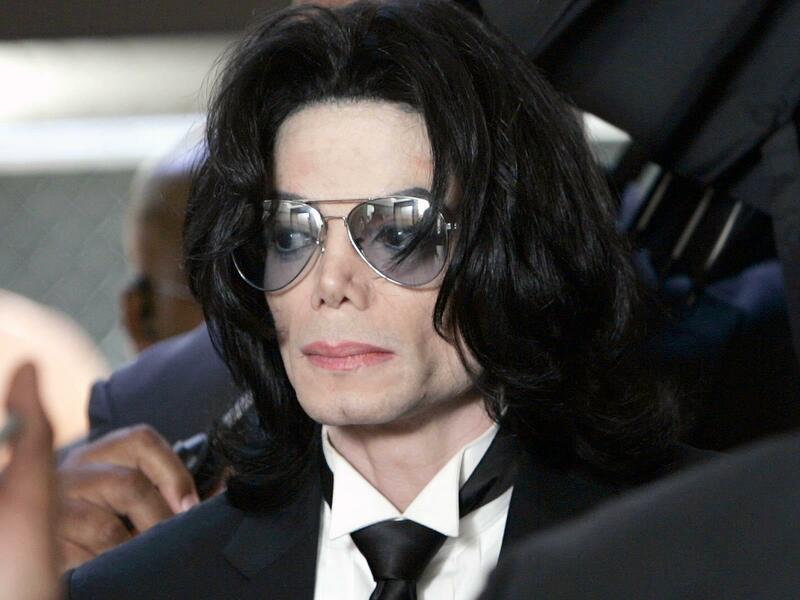 The Truth: Paul is alive and actually came closer to death when a judge told him he had to pay Heather Mill $235 million in his divorce settlement. 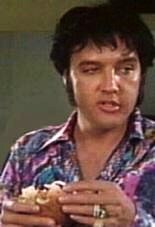 Supported by: Elvis weighed approximately 275 pounds at the time of his ‘supposed’ death, yet the casket ‘they’ say he was buried in weighed only 210 pounds. Anti-Conspiracy: The king didn’t fake his death, but actually died three days later after finishing second in a chili dog eating contest at the Dunes Hotel in Las Vegas. The Truth: Elvis’ death has never been certified and rumors fly around this time of year when an elderly duet that looks an awful lot like an aging, 65 pound lighter Elvis and Jimmy Hoffa, appear for their dinner show in Sun City, Las Vegas. 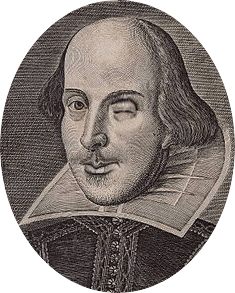 Anti-Conspiracy: Shakespeare actually wrote the plays, but in a hurry to get to the airport one morning, left them at a table at Starbuck’s where they were ultimately picked up by Francis Bacon, Christopher Marlowe and Woody Allen. Supported by: A ‘moon set’ was found inside an old cheese warehouse in the New Mexico desert; they also found a man in the warehouse with a large, round, glowing, orange face. Anti-Conspiracy: No New Mexico license plates were found on the lunar lander. 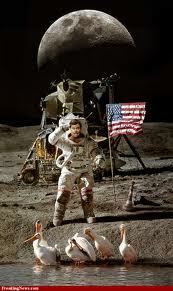 The Truth: We of course landed on the moon and ended up bringing back some aliens and weather balloons and accidentally left them just outside a warehouse in Roswell, New Mexico. I may be a little confused about that moon landing thing, but hopefully I’ve cleared up a lot of conspiracies for you theorists out there; although things like, ‘Is wedding cake really a birth control method?’ still remains a mystery to us. Subscribe and you can more easily delete the weekly email. San Francisco icons generally come in steel (the Golden Gate Bridge) or concrete (Coit Tower). But sometimes they appear in flesh and blood and that is certainly the case of Vivian and Marion Brown, otherwise known as “the Brown Twins”. The picture at left, in their bright red suits and trademark leopard coats, shows them at the height of their fame, when the world had discovered them. But those of us who “knew them when” had known they were special for a long time. In 1977 I started a job in the Financial District of San Francisco. It was a fun time – before über traders and panhandlers took over the streets. And, let’s face it, it is one of the best cities on Earth to experience quirkiness. One particularly nice day I took a walk from my office on Montgomery Street up to Union Square. 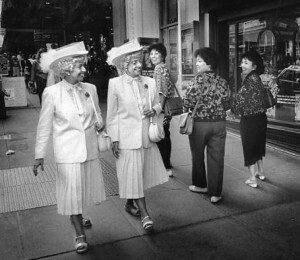 Somewhere on Post Street I spotted two middle-aged women, identical in looks, dress and cadence. I did what most people do when first confronted by the Brown Twins; I did a double take, watched them as they walked the rest of the block, and then grinned from ear to ear. Turns out that the Brown Twins came to San Francisco in the 70’s from Kalamazoo, where they were born and raised. They were co-validictorians of their high school class and both went on to earn a teaching credential. After three years of “that low-paying job” (as they described it), they moved to the City and became secretaries. Except for six months of their life, they dressed identically every day. They always lifted their forks in unison and always walked in lockstep. Neither of them married, although they did date twin brothers they met at a twin convention back in Michigan. The romances fell apart when Vivian and Marion unilaterally decided to switch dates. The twins would spend the rest of their lives together – the pleasure of each other’s company was more than enough to provide them with satisfying lives. They eventually became so well-known that they were included in all things San Francisco: socialite parties, grand openings and civic celebrations. Everything except “Beach Blanket Babylon”. The producers said they never included an act depicting the Brown Twins because no two actresses could ever pull off on stage what the Browns did every day on the street. The Browns hit the jackpot in 1988 when they were featured in a Reebock commercial. After that they became frequent guests on talk shows and were featured in commercials for IBM, Payless Drug, AT&T, Dell, Apple and Joe Boxer shorts. Richard Branson, founder of Virgin Atlantic, was so enamoured by them after they shot the commercial for his airline that he flew them first class to London for a shopping spree at Harrod’s. But like all things in our fast-paced world, the public lost its infatuation with the Browns. They still strolled the streets of San Francisco, in their leopard coats but they slowed down. Finally, last July, Vivien fell and was taken to the hospital. The doctors discovered that she was suffering from Alzheimer’s disease. Marian, ever faithful to her sister, had been trying to care for her on her own. The sad truth was, like many elderly people, they simply didn’t want to be apart and didn’t have the money for adequate care. The residuals and appearance fees had dried up long ago. True to form, when the citizens of San Francisco heard of the twins’ plight, they came to the rescue. Money poured in to help pay for Vivian’s care, from rich and poor, famous and not famous, literally from every part of the city. People sent money for Marian’s daily pizza, some offered to drive Marian to visit Vivian each day, others organized fund-raisers. But in the early hours of January 9th, Vivian succumbed to her illness. She was 85. Which means that for the first time in 85 years, Marian is all alone. It’s hard to imagine how hard that must be for her, literally losing a part of herself. I hope that she can take some solace in knowing that for many years she and Vivian brought joy to anyone who saw them. 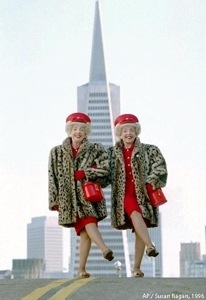 For me, the Brown Twins will always be a part of what made working in San Francisco a cherished memory. Twenty-thirteen portends to be an unusual year for me, perhaps even paranormal, what with all the ‘other side’ things that helped usher in a year with a 13 in it. No, I’m not superstitious, but like Michael Scott, I am a little ‘stitious’. 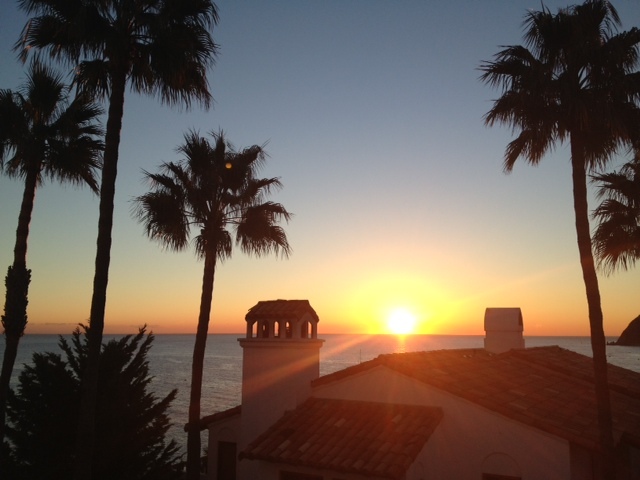 While most New Year’s days I’ve watched the sun set into the Pacific Ocean somewhere along the ‘left coast’, this year I welcomed in the new year on the ‘other side’ watching the sun coming up over the Pacific from Hamilton Cove on Catalina Island – truly a unique experience. OK, truth is there haven’t been too many years when I’ve even seen the sun on New Year’s Day, but that’s another story. If you’ve never been there, Hamilton Cove looks like it belongs on the ‘other side’ of the Atlantic, perhaps on a Greek island coastline or hanging somewhere off the Amalfi Coast in Italy. 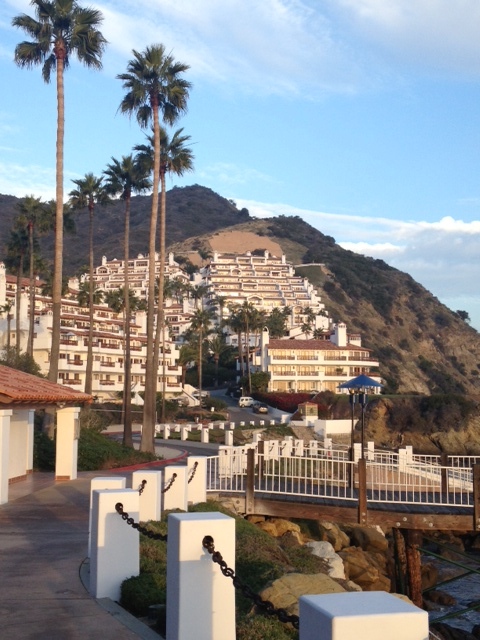 I suppose if you have been there, it still looks that way, but as if getting away from it all in Catalina wasn’t enough, several of us wanted to get away from the people who wanted to get away from it all – to the ‘other side’ of Catalina. I discovered that Catalina is a little like the moon, in that most people only see one side, although I can tell you now from experience, that the ‘other side’ of Catalina is not dark . . . unless you go at night, then it’s really dark. Like the moon, it’s not easy to get to the ‘other side’ of Catalina, you have to have a pass that gets you through the gate on the road to the ‘other side’ that goes through the infamous ‘Airport in the Sky’, Catalina’s private airport where planes don’t really take off from the runway, the runway simply drops out from under them after several thousand feet and, presto, they’re airborne. ‘Second oldest hotel in California’ – so stated on Google about the Glenmore Plaza Hotel, but it doesn’t say who’s first or when the Glenmore was established. Wikipedia probably got their information from Jimmy Jr. too. I also found on Google a picture with a caption that said, ‘Second oldest hotel in California’ – it was not a picture of the Glenmore. 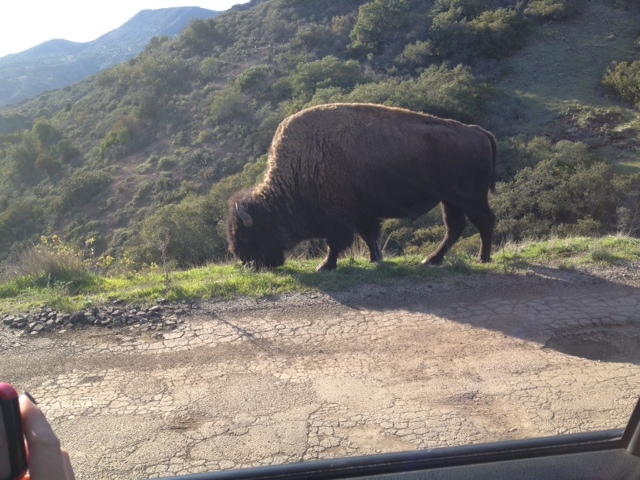 Meanwhile, back on the road to ‘the other side’, just before reaching the airport we see a buffalo standing alongside the road. I’ll tell you the history of how buffalo got on the island . . . another time. After a brief stop at the airport, we start down on the western slope of the island; the paved road turns to dirt. We drive past El Rancho Escondido, a ranch, Michael tells us, started by the Wrigley family back in the ‘30s for breeding Arabian horses – another story too long to tell here. We also pass a vineyard – yes, another story. 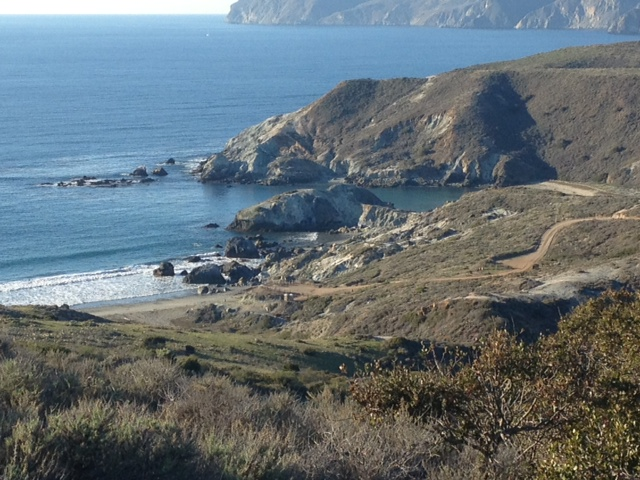 The road leads us to a west coast inlet called ‘Little Harbor’, where there is no man-made harbor, but a small campgrounds and no campers, no nothing except a beautiful uncluttered coastline, which is pretty much what all of the ‘other side’ of Catalina is. We walked along the beach on this beautiful January day and enjoyed the fresh air, sunshine and solitude. Our return to civilization is uneventful except for the stories Michael tells us of the ghosts that inhabit the island. Back in Avalon we thank Michael for exposing us to the many stories and sides of Catalina, particularly ‘the other side’. Subscribe to our blog and get it ‘free’ (yes, it’s already free) and have it come directly to your email (not to your ‘spam’ file!). Have you noticed that we are surrounded by diet tips this time of year? No matter where I’ve turned lately, someone is telling me how I can expend calories, lower my BMI or lose weight. Frankly, I don’t think my weight is any of their damn business. Usually I enjoy reading USA Today – the articles exactly match the (short) length of my attention span. And there are pictures – lots of pictures. But this past week even they bombarded me with diet and exercise tips. The Main news section went into an agonizing description of every diet and which medical group endorses it. Blah, blah, blah. Then the Money section dissected the cost of the various diet plans. Sports calculated the calories used during simple everyday tasks like mowing the lawn, chopping wood, and rock climbing. Clearly they’ve not taken into consideration people such as myself. I need to know the net calorie count of sitting on the couch eating popcorn while watching “Downton Abbey”. Finally, the Life section had real life stories of people who had lost 100 pounds. I don’t care what they say, you just know these people are miserable. And most of them gain it all back in a Bacchanalia of Domino’s pizza and grape slurpees. 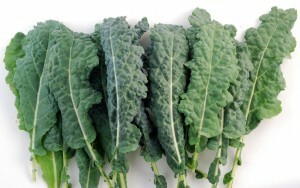 I blame a lot of this diet craze on the recent assent of kale. Who had even heard of kale five years ago? Now it’s in everything. Restaurants feature kale salad, which is basically kale and then a lot of things mixed with it to mask the taste of kale. There are recipes in magazines for kale chips, kale smoothies, and I even saw one for kale ice cream. The kale craze really hit the Rubicon when one famous, do-gooder, skinny-as-a-rail chef suggested putting kale in a chocolate cake recipe. That is one step too far. Not on my watch will something like kale ruin a perfectly delicious confection of sugar and butter. So for me, I’m going to cut out the middle man this year and not even start a diet. And I’m certainly not going to add freaking kale to my meals. I’m sticking with the triple chocolate cake from Costco (minus any kale, thank you very much) and I’m guessing that I will end up weighing the same at the end of 2013 as I do today. And I won’t have had the humiliation of kale stuck to my teeth. Note: This week we changed domain name to “From A Bird’s Eye View” so it now matches the name of the blog. The bad news is that if you want to continue to get our weekly posts in your email you will need to sign up again. It’s not hard…just put your email address in the subscribe box on the upper right side of this post and we’ll appear in your inbox each Monday. Thanks!